So Yahoo Inc.'s CEO Marissa Mayer is in the line of fire again. First fingers pointed, tempers flared and accusations swirled around the youngest person to run a Fortune 500 company last September, when she became a mom and only took two weeks maternity leave. She had her reasons. Who is anyone else to judge? 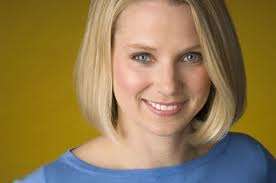 Now, the 37-year-old she has pulled the plug on Yahoo employees working from home. No more telecommuting for the more than 11-thousand men and women who work for the company. Again, the woman who earns upwards of $115 million over 5 years has her reasons. While I politely disagree with both decisions, I am not walking in her shoes. I don't see the world through her lense. I have my opinion and that's it. Both issues bring up a topic that has both amazed and appalled me since I became a parent almost 16 years ago: How lightning quick parents are to judge other parents. Whether it is their parenting style, their decision-making, how they raise their children, I have seen this destructive judgmental style time and again. One of the areas where it is most apparent, in my opinion, is where it concerns stay-at-home-parents. Somehow, there is an unwritten rule that stay-at-home moms and dads have given up, thrown in the career towel, can't find a job, resigned themselves to baking cupcakes and shuttling kids to playdates. There is apparently another unwritten rule that parents who work are abandoning their children, throwing them to the wolves (the system — school, society, whatever). These are also parents who apparently don't like to bake cupcakes, volunteer at school or organize playdates. If parents can pursue the goal of supporting each other, sharing lessons learned, harnessing the power of knowledge and education they have acquired as individuals and from other parents — we would all be in a much better place. Expend energy empowering each other and not bringing each other down. Marissa Mayer has her reasons. Every leader, visionary, someone running a company or a household has to make tough decisions and difficult choices and live with the consequences — good, bad or ugly. Who are we to judge? By worrying less about what the Jones' are doing as parents, and focusing on what is going on in our own homes, we might all be in a better place. It takes a village to raise a child. It worked for our parents. The village may have changed, but the premise remains true.